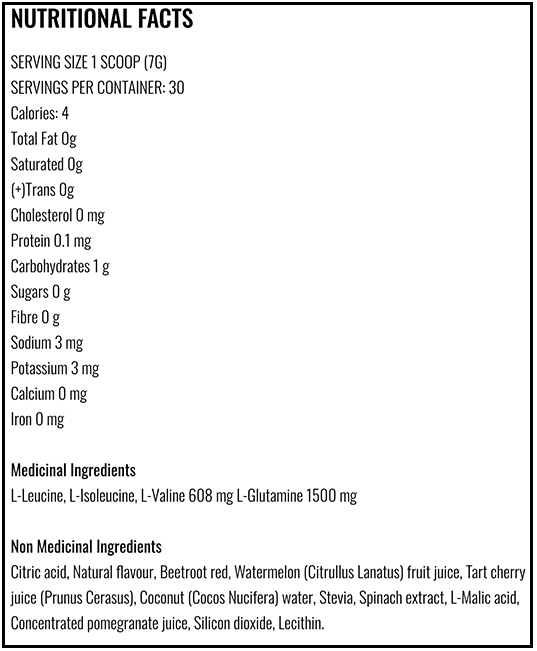 Branch Chain Amino Acids that aid in building lean muscle with no artificial sweeteners, colours or flavours. 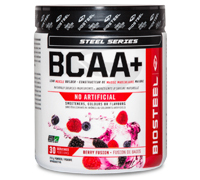 BioSteel’s Steel Series BCAA+ delivers an all-natural muscle building boost, providing the ideal 3:1:1 ratio of essential amino acids your body needs to support muscle growth, enhance strength, and improve overall performance at every stage of your workout. 1500 mg of Fermented Glutamine combined with 3000 mg of Essential Amino Acids Leucine, Isoleucine and Valine. Since the body cannot produce essential Amino Acids naturally, these nutrients must be obtained from the diet. Beet Root Powder, Watermelon Powder, Spinach Extract Powder and Coconut Water Powder. These essential amino acids are the building blocks for new protein production which help during muscle building. Before, during or after a workout/exercise/practice.